The anticipation of battle is high, right from the opening moments of the episode. The Skye Boat Song melody is given the war treatment, complete with stirring pipes and drums. The camera focuses on the precision of the drummers’ movements and we are given another reminder of the ritual and ceremony involved. Everyone has a part to play - musicians included. 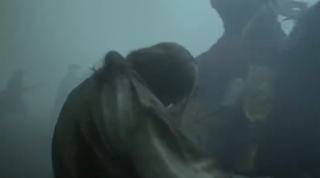 As the episode’s real action begins, Claire is standing over the body of a dead Highlander who has fallen foul of the redcoats. Her voiceover muses about how many men she has seen killed in war and wonders at the chances of them actually being able to change the outcome of history. Jamie calls to her, asking how long it takes her to answer a call of nature and Claire, with one final look at the ruined body, picks up the soldier’s discarded weapon. How many men has she seen killed in war? Far far too many. It is a grim opening to the episode and a stark reminder that nothing about a battle is certain. No matter the outcome and despite their best efforts, any one of them could meet the same fate as that of the Highlander corpse. There are certainly no winners in war. If the opening scene sets a sombre mood, the following scene sets a frustrating one. Jamie is attending a strategy meeting with Charles Stuart and the other commanders, chiefly the Irish Quartermaster, John O’Sullivan and the Scottish General, Murray. But plans are not going well, with the quartermaster favouring immediate attack and the general reluctant to abandon the high ground that he has rushed his army towards. Jamie too, is reticent to charge towards the English, as it will require the attackers to cross the boggy Tranent Meadow. As the quartermaster and the general begin to hurl insults at one other, Jamie and the commander of Clan MacDonald strategise over a new plan: sending cavalry into the area to test the bogginess of the ground. Meanwhile, resplendent in a gaudy, gold trimmed tartan outfit and making frequent visits to the food table, Charles Stuart suggests that they have already taken two cities without the need for firing a single shot. Moreover, says the Prince, the people in those cities welcomed him with open arms. Jamie reminds Charles that on both occasions they had possessed the element of surprise,which is not the case here. Charles suggests setting up a meeting and offering generous terms of surrender, musing that surely no-one is really keen on bloodshed. Diplomatically, the quartermaster praises the Prince’s kind heart, but says that the time for talk is done. They have sailed for France to fight a war, after all. But General Murray is equally adamant. He will not risk the destruction of his own army, he says, by ordering it to cross potentially lethal ground. Tempers flare and the General leaves. Jamie instructs Clan MacDonald to await orders, but adds in an undertone that these may be some time. 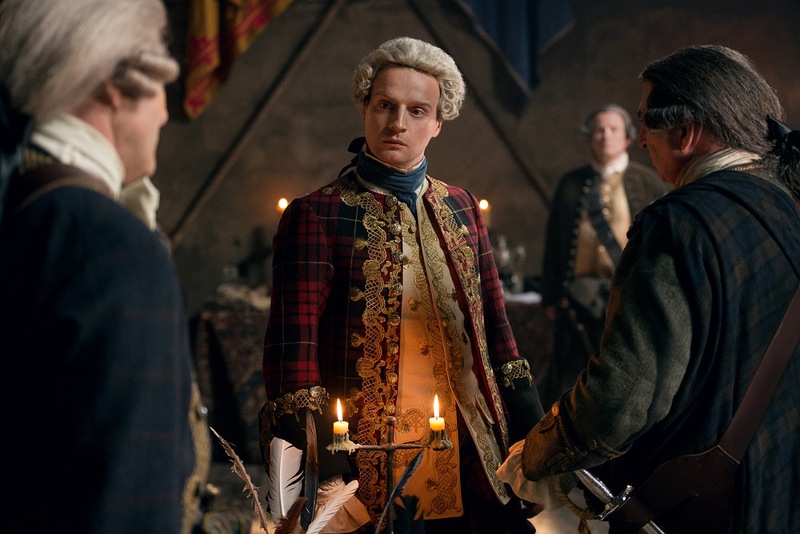 The meeting breaks up without resolution and Charles walks out with Jamie, asking why the Scots are such retractible people. Jamie responds that the Irish are just as stubborn, but Charles is despondent. The cause must succeed, he says, because he has promised his father and God that it will. Talk turns to Claire’s role throughout the battle, ministering to those who are wounded. Jamie remarks that Claire is setting up a field hospital and so Charles makes an unbelievable request. He wants British casualties tended to before Jacobite ones, he says, because the English are his father’s subjects too. He wants the English to realise that war is being waged on them with the greatest reluctance and that it is his wish that one day they will all be friends again. Jamie advises Charles not to share this sentiment with the men and also tells him that Claire is unlikely to follow such a request. Charles muses that she is more likely to do so if the request comes from Jamie himself. Turning away and raising his hand in expectation of it being kissed, the prince closes the conversation. 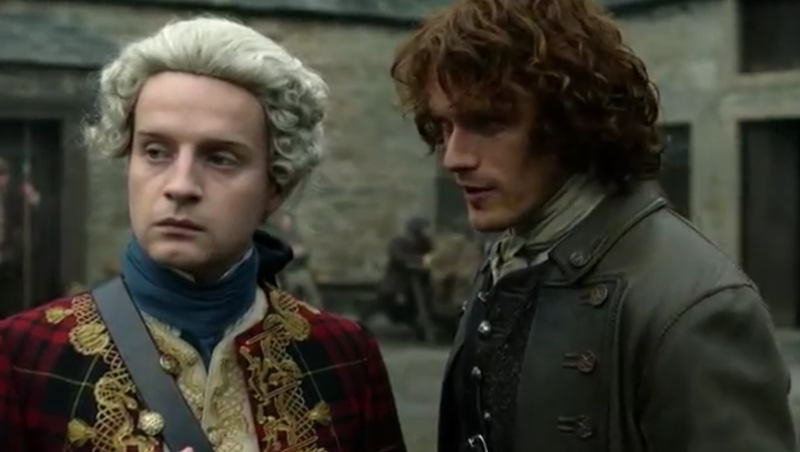 The look on Jamie’s face is priceless: Charles Stuart truly has no idea - on any level. Meanwhile, the lack of action is beginning to take its toll on the men. Sitting around the campfire with nothing to do, Angus starts spitting ale at Kincaid, one of the men from Lallybroch, until Kincaid snaps. Kincaid’s friend, Ross, tells Angus that he shouldn’t waste the ale, but should rather save it to quench the thirst from battle later on. Rupert and Angus then begin needling the Lallybroch men, mocking their choice of phrasing and calling their courage into question. Tempers flare quickly. Angus holds a blade to Kincaid’s throat, threatening to open him “from belly to bone”. Murtagh intervenes, telling Angus to put the blade down before he puts it somewhere unpleasant, leading Angus to switch his anger to Murtagh. Their arguing wakes Dougal, who smashes a bottle against the rocks in his own show of anger. It is a prime time for the laird to appear and calm things down, which is precisely what Jamie does. Observing that his men are getting on about as well as the commanders, the talk is turned deftly from the squabbling men to the lack of a battle plan. It is a small deflection, but yet another indication of Jamie’s instinctive leadership. He begins to speak of what is required: a reconnaissance of the marshland between them and the British camp, in order to discover if the ground is solid enough for the army to cross. Leaving the men to their own devices once more, Jamie asks Dougal for a word in private. Jamie and Dougal begin discussing the reconnaissance plan in more detail. Someone must ride out into the marshland, says Jamie. If a man on horseback can be supported, then so could an infantry. But it is a risky proposition. Dougal observes that Jamie cannot undertake the mission himself, vital as he is to Charles Stuart. Jamie agrees, but states that someone must risk the doing. It is an excellent strategy on his part, knowing that Dougal will be unable to resist an opportunity to impress the bonnie prince. Indeed, Dougal starts to plan what would be needed - staying within a safe distance of the range of the British guns. 125 yards is suggested by Jamie, reduced to 105 by Dougal, deeming the plan to be a gamble, but one which is worth the risk. 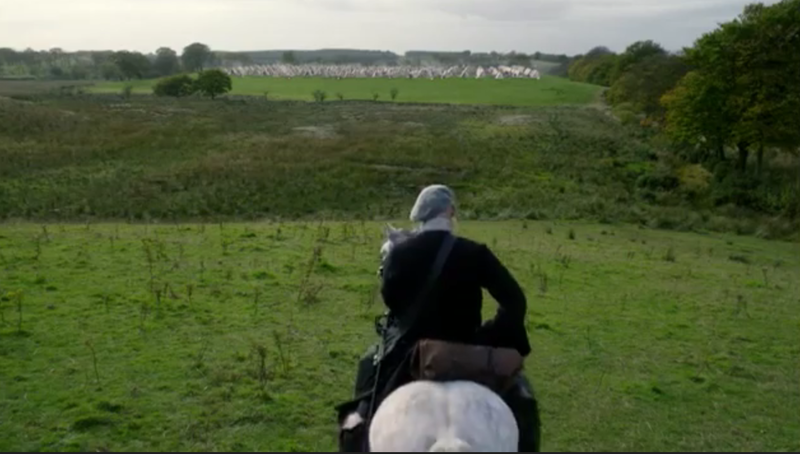 Moments later, a mounted Dougal rides through the camp, headed for the marshland. The men, realising what he is doing, gather to watch. Amidst calls of “mad man”, an obviously nervous but determined Dougal begins his journey towards the British. He is soon noticed and the British soldiers begin to load their rifles. Back on the hill, the prince has joined the watching men, branding Dougal a remarkable fellow. Angus engages him in conversation, and is awed to discover that he is speaking to the prince himself. By contrast, the prince doesn’t seem remotely interested in speaking to the Highlanders, waving away Rupert’s compliments without even turning his head in their direction. In the centre of the meadow, Dougal’s horse becomes stuck in the boggy ground and the British begin to fire. Dismounting, Dougal tries to turn his distressed horse around. As Jamie and the others watch with increasing concern, bullets start to land uncomfortably close to Dougal. Finally, one passes through his bonnet and grazes his forehead. But rather than display any fear, Dougal merely replaces his bonnet with the barest of sarcastic smiles. He leads his horse back towards the assembled Scots and receives a hero’s welcome. To his surprise and ultimate discomfort, Dougal finds himself locked in an impulsive embrace from his Prince. Charles states that if he had a hundred men like Dougal, the war would soon be over. Humbled, Dougal mutters that while he’s not sure about that, he can confirm that the meadow is unsafe to cross. This is a signal for the squabbling between the Irish quartermaster and the Scottish general to begin again, the latter saying that they should decamp and remove themselves to Edinburgh. Yet the enemy are not in Edinburgh, states a frustrated prince, adding that he is relying on the general to break the stalemate, or he will have to be replaced. Handing Dougal a bottle, Jamie remarks on his uncle’s luck and states that he should have the cut on his forehead seen to. Dougal declines, but admits that a change of clothing is in order... While ultimately unsuccessful in forcing a charge towards the enemy, the mission has at least done much to improve the morale of the men while they wait for a plan B to take shape. While Jamie is displaying his leadership tactics in the open air, Claire is similarly taking charge in the makeshift field hospital. 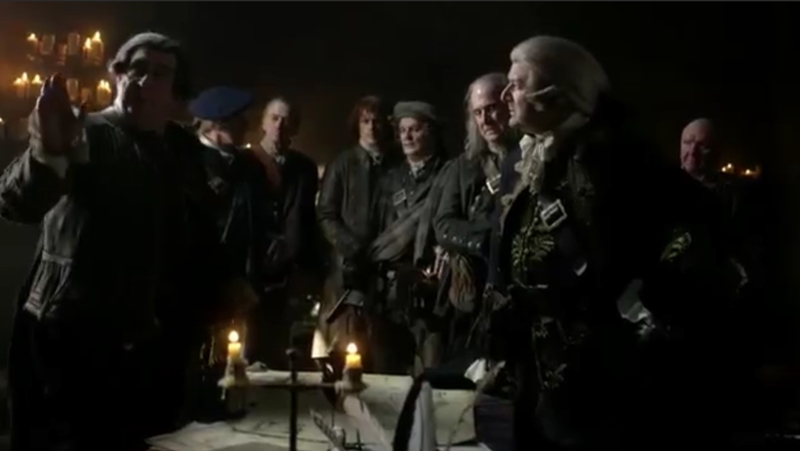 With a handful of women around her, Claire is attempting to instill some morale of her own, as she explains to the women - and a rather disgruntled Fergus - what their individual tasks will be, as they prepare to tend to the wounded men. 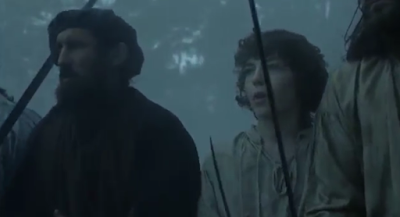 The preparations take some time and it is dark when Fergus bursts back into the hospital area, followed by a young man, who Fergus explains, has information of the utmost importance for the leader of his Highness’ army. Introducing himself as Richard Anderson, the young man explains that he has lived on the land all his life and knows of an alternative way down the ridge, a hidden trail past the bog which will allow them to catch the British unawares. 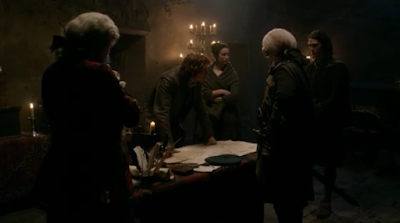 Claire sends Fergus in search of Jamie and soon another strategy meeting is taking place, with Jamie, General Murray, Claire and the prince listening to Anderson’s explanation of the path’s location. Not marked on any map, it is there, but difficult to find unless you know where to look. Murray remarks on how this good fortune seems almost too good to be true, but Anderson proves his trustworthiness by promising to lead the highlanders down the path himself. While he’s not much for fighting, he says, he can at least lead them across the meadows without a misstep. The prince is reticent at first, but is swayed by Jamie’s pronouncement that delay could prove fatal. Finally the decision is made: they will go, says the prince, and not return unless they bring victory back with them. With the fighting now assured, the men start to think about their own mortality. In a matter of fact way, Ross and Kincaid share secret hiding places of savings and promise to care for each other’s wives, crofts and children. Ross says, “What’s mine is yours and yours mine” and, with a spit and a handshake, the two make their living wills. It is a conversation overheard by Angus, who for the first time, abandons his practical joking and tries to make a similar deal with Rupert. Not able to be totally serious though, he offers his friend his sword, dirk, sporran (and all that it contains) and his whore. Rupert however, is unimpressed. What use does he have for a sword that hasn’t been used, he asks and comments that Scarlet the whore isn’t Angus’ to give away. 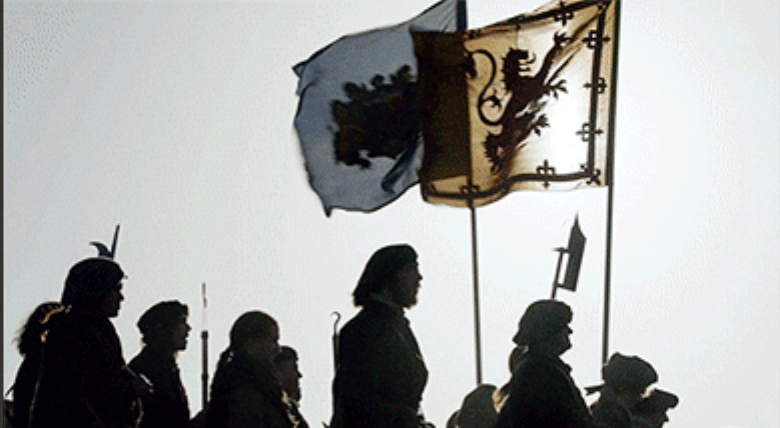 Most importantly though, Rupert refuses to make the same deal that the Lallybroch men have. He is more superstitious, refusing to put final plans in place that may bring “the devil’s own eye” down on them. Murtagh and Jamie too, are in a contemplative mood. Murtagh is concerned that his death needs to mean something and that if he is just one casualty in a large battle, then how will his memory live on within the clan? Jamie says that he can’t offer any words of comfort, mentioning Paris and how he almost lost his marriage trying to stop the rebellion from happening. “I failed,” says Jamie, but Murtagh immediately corrects him. “We failed,” he says. Jamie lays a grateful hand on his godfather’s shoulder, saying that it’s any solace, he feels the same way that Murtagh does. 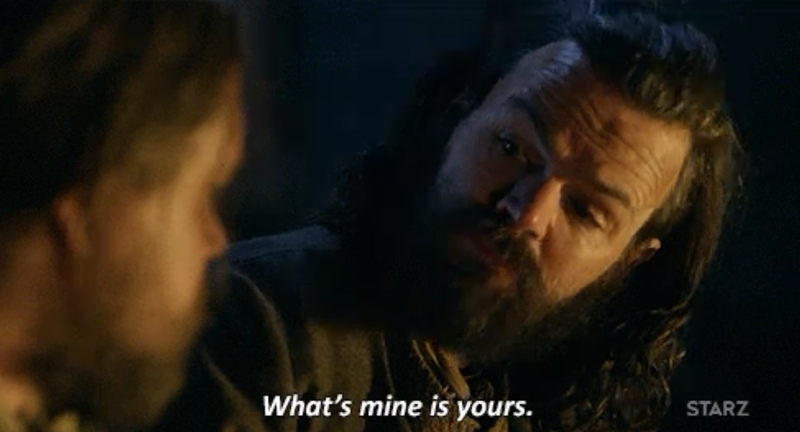 This is indeed solace to Murtagh. Jamie and Murtagh know, without saying it specifically, that the memory of one would live on in the other, should either fall. It is this simple understanding between two men of a similar mind that gives their lives the meaning that they both crave. Jamie goes to Claire and the two share a moment together before the battle. Commenting that sleep isn’t going to be an option for anyone that night, they seem about to fill their time with other activities when they are interrupted by Fergus, who requests permission to join the fighting. Fergus will steal into the tent of General Cope, he says and steal the general’s sword. 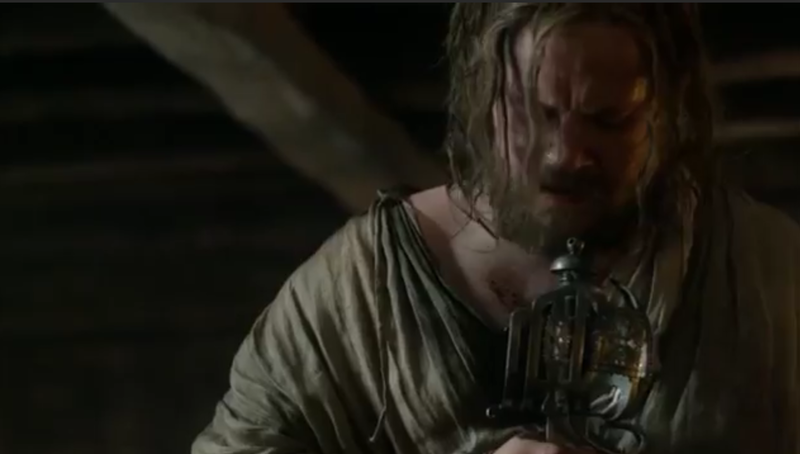 Jamie tells him kindly that while he doesn’t doubt his capabilities, he needs Fergus to look after Claire and the other women, because there is no-one else he would entrust their safety to. Claire wraps a motherly arm around the young boy, telling him that it looks like he must stay behind and like it. 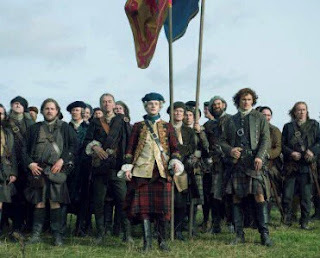 At last the moment has come and Angus, Rupert and Murtagh come to collect Jamie, so that they can, in Angus’ words, send the British army to hell. It is a beautiful scene, each man trying to keep up a brave front as they say their farewells to Claire. Angus asks for a kiss, which she grants, while Rupert refuses to say goodbye, telling her that they will share a dram together after the battle. 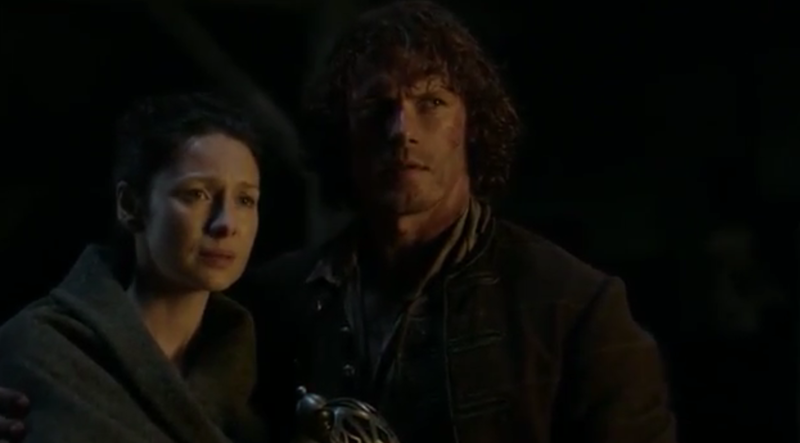 Tearfully, Claire asks Murtagh to watch over Jamie. “Of course,” Murtagh replies, before checking that they will win, as the “promise of history” has stated. Claire confirms this fact, but each of them is all too aware that while the overall result may be certain, the survivors and casualties still remain a mystery. True to his word, Richard Anderson leads the men down the hidden path, as Claire orders the women to get some rest. Looking around, she suddenly realises that Fergus is missing. All too soon we see why. Moving quietly amongst the group of soldiers, wide-eyed and clutching a knife, is Fergus. When they reach the outskirts of the British camp, Anderson tells Jamie that he will leave them there. Jamie thanks him, remarking that all of Scotland is in his debt. Moving over to General Murray, Jamie instructs the older man to ensure that Prince Charles remains behind the lines during the battle. The prince is indignant at this. He has a sword, he says and is trained in its use. Moreover, the army is his and he wants to be the one to lead it into battle. But Jamie tells Charles that the rebellion would never survive the death of its prince. And surely, he adds, regaining the throne would not mean as much to Charles’ father without being able to share the moment with his son. At this, Charles utters a line that is equal parts amusing and sad - “Mark me, I don’t believe my father is all that fond of me.” But Jamie remains insistent: Charles is to remain behind the lines with the quartermaster and the general. Meanwhile, Claire is giving a pep talk of her own. The women are tense as they make their preparations and all is silent in the makeshift hospital. Claire tells them that she knows how they are all feeling, but that their men are depending on them and they will not let them down. Moving between them, Claire checks the bandages, honey water supplies and the sterilisation of the instruments. Certainly the men stand a better chance of survival with her 20th century knowledge - another little nod to the possibility of Claire being able to change history simply by her presence. Another atmospheric Bear McCreary soundtrack begins to build as the highland army waits in the morning fog. Tensions are high. Finally Jamie gives the signal, removing the plaid he has been using to camouflage himself. The others follow his lead, Jamie raises his sword and they move forward. It is a brilliantly filmed scene. The men run in slow motion, and we hear nothing except the building music. It’s heart pounding stuff. Suddenly the music stops and in the brief silence we see a sleeping British sentry leaning on his rifle in the fog. Then the actual volume kicks in. With the Tularch Ard battle cry, the soldier is cut down, the first of many. Back at the hospital, the women turn towards the noise. The battle has begun and one of the women begins to pray, as Claire sends another for more hot water. They can do nothing they can do now but wait. The actual battle of Prestonpans lasted about a quarter of hour. It is hard to imagine that it was any more bloodthirsty than what we see on the screen. Blood flies, swords slam into skulls and the highlander shirts are soaked in blood. Full of adrenaline, the men yell and scream. It appears as if the British soldiers will be little match for the Jacobite rebels. Back at the hospital, things have changed. Wounded men are everywhere and Claire and the other women move between them. Suddenly, Claire notices Ross, who enters carrying Kincaid over his shoulders. As soon as Ross lays his friend down for Claire to examine, we realise that we are looking at the first Highland fatality. Kincaid’s eyes are lifeless and Claire closes them, turning to Ross and saying, “I’m sorry. He’s gone.” She stands to tend to the other living men, but Ross reaches out his hand and stops her, his eyes still on his friend. Claire tells him that there is nothing more that she can do. She moves away and Ross begins to grieve. On the battlefield, the Jacobites are winning. Fergus however, has discovered that the battle is not the grand adventure that he had thought it would be. He looks terrified, slashing his knife and turning away from the bloodshed as men run all around him. 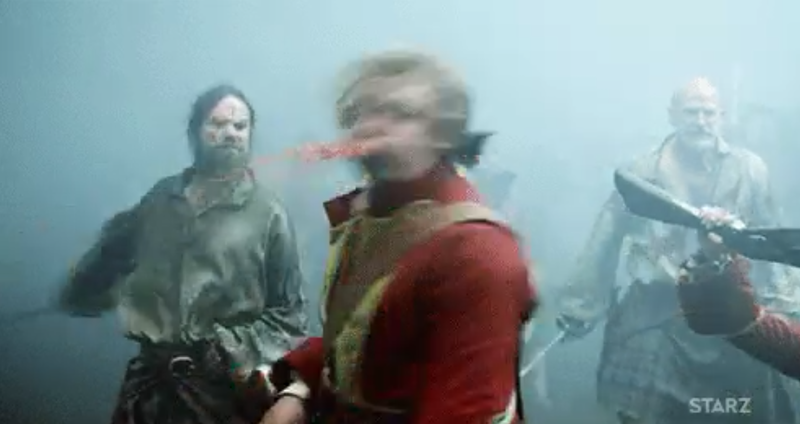 One of the British commanders is screaming orders to his men, when he notices a Highlander and gallops towards him, slashing through the man’s side. The Highlander is Rupert and we see him fall just as the scene shifts back to the hospital and the announcement comes that the British wounded are arriving. 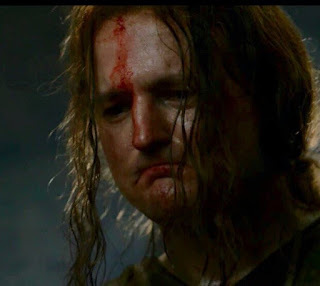 Claire begins to sort the Englishmen by the severity of their wounds, having been reassured by their commander that the men mean them no harm. This sorting is interrupted by the arrival of Angus, supporting a badly injured Rupert and screaming to Claire that Rupert needs her assistance immediately. 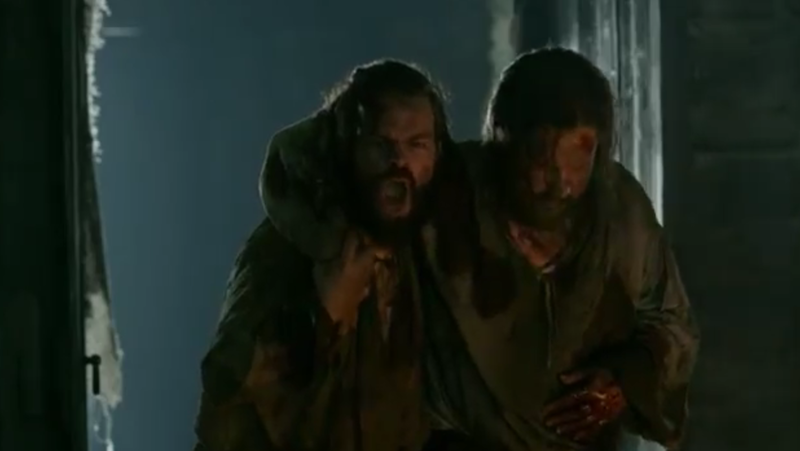 Angus’ eyes are full of tears, telling Claire that he will not allow Rupert to die on him, and that she must help him. Claire examines the wound - a deep and ugly gash. 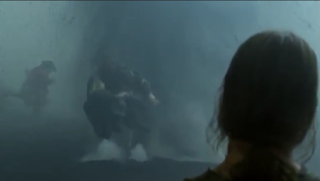 As she tries to sedate Rupert a little, the injured man asks about Angus, saying “Is he blown up?” Angus explains that Rupert is referring to a canon blast, but that it’s nothing. Claire gets to work, calling for thread to sew up the wound before an infection sets in. As she works, we see the rest of the event in flashback. Angus had shot Rupert’s attacker off his horse, before a canon blast knocked him off his feet too. The operation over, Angus asks Claire if Rupert will live. She replies that she doesn’t know, but that as long as the wound doesn’t fester, Rupert’s strength will stand in his favour. Claire turns to examine Angus, checking his eyes and asking if he is nauseous. Suspicious of a mild concussion, Claire tells Angus to stay by Rupert and to stay awake. Angus replies that while he is bone weary, he plans on focusing on watching Rupert’s big belly going up and down. Claire lays a reassuring hand on Angus’ back, adding that as long as it does, there is hope. This is a side of Angus that we have never seen until now and we understand again the fierce friendship between the two men. Despite his practical jokes and short temper, the simple fact remains that Angus loves his friend. A triumphant Jamie and Murtagh arrive, with Jamie announcing that the day is theirs. Amidst the excited talk about what they could have done with cavalry and how they might have captured General Cope and assured victory that very day, is the tender and relieved reunion of two soulmates. 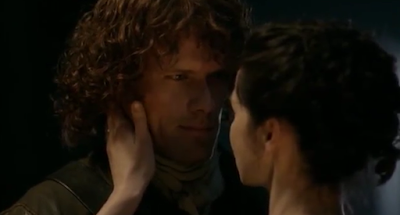 As with the leave taking, the emotional moment of reunion is conveyed purely through the looks that Jamie and Claire give to each other and the desperation with which they cling to each other. Breaking away, Claire checks Jamie over for injuries. Then she remembers Fergus and asks where he is. 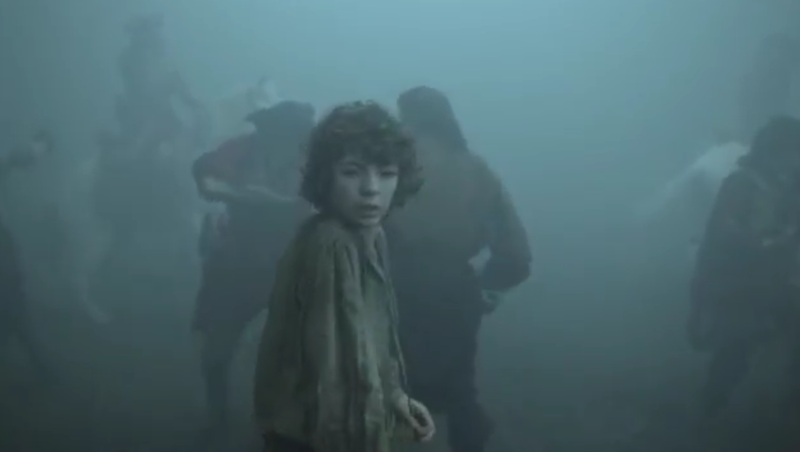 Jamie replies that the boy is outside and Claire hurries to find him. There is no triumphant young man waiting for Claire however, but a lost little boy, still in shock from what he has seen. 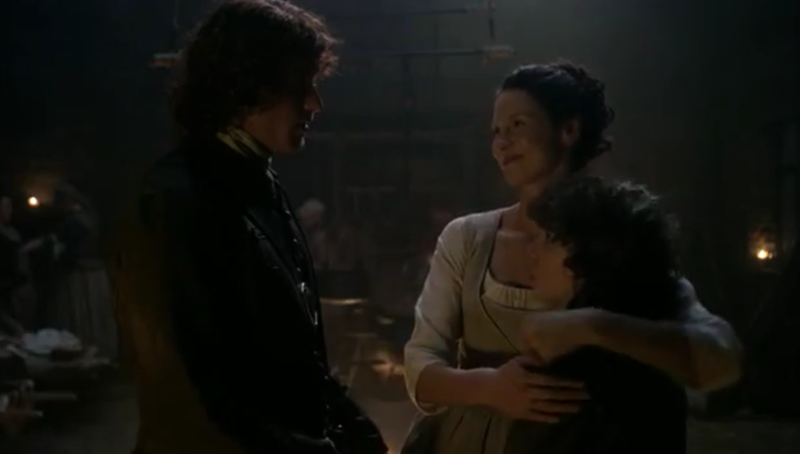 In full maternal flight, Claire gathers Fergus up into her arms, calling him a wretch for sneaking off and saying that she should box his ears. Fergus stammers that he thinks he killed an English soldier. Claire hugs him fiercely, saying how sorry she is and asking if he is injured. Fergus replies that he is just very, very tired. Claire leads him away in search of food and a bed, as the casualties start to spill out into the courtyard. Dougal, meanwhile, is still at the battlefield, dispatching living British soldiers with a knife to the chest. Hearing his name, Dougal turns around, to see an injured Lieutenant Foster, the English soldier who had escorted Dougal and Claire to the village of Brockton during season 1. 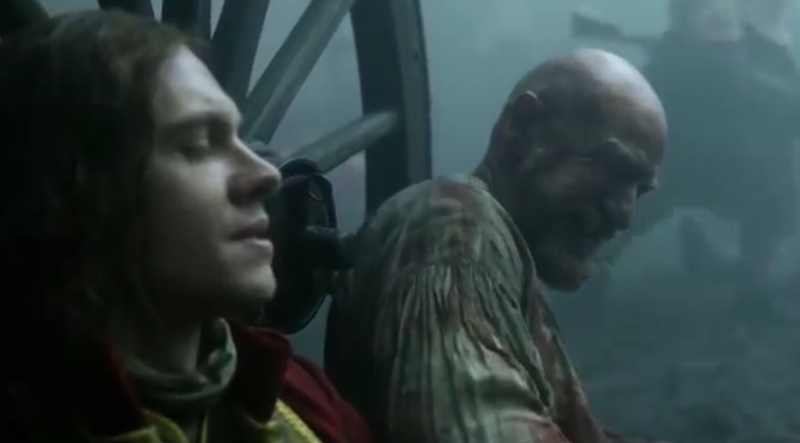 Dougal quickly remembers the man, branding Foster the only honourable redcoat. He sits next to Foster on the ground, as the English soldier asks to be taken to the infirmary. Dougal laughs, asking if Foster expects to be carried there and remarking that he still has work to do. It is at this point that Foster makes a fatal error. He tells Dougal that while the Jacobites have won the day, Dougal as a war chief should know better -the Jacobites will not beat the British army. They have won the battle, but will never win the war. It is not what Dougal wants to hear. He looms over Foster and sinks his blade into the Englishman’s belly, saying “Only God knows the answer to that”. Once Foster is dead, Dougal wipes his blade on the soldier’s shirt, adding that if the lieutenant is right, he will look for him in hell. 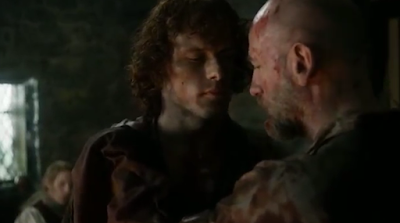 This is an uncomfortable scene and many fans have expressed dismay at the callous way Dougal is portrayed here. But the fact remains that Dougal is a war chief and a fervent Jacobite to the point of fanaticism. It is certainly not beyond the realms of possibility that when faced with an enemy soldier telling him that his cause is ultimately doomed, Dougal’s bloodlust would still be sufficiently roused to take the action that he does - however distressing this is for the viewer to watch! At the hospital once more, Angus and Ross stand over their friends. Angus is watching Rupert like a hawk, while Ross gently pulls the blanket up over Kincaid’s face. Catching Angus’ eye, he says simply, “We did not run.” Angus nods and with that simple action, the two share a moment of reconciliation. 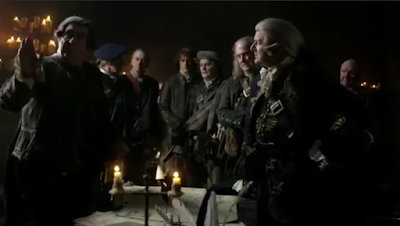 Murtagh and Jamie join Angus, attempting to lighten the mood by saying that Rupert’s size and his love of “third portions” will no doubt save him. Jamie commits the faux pax of referring to Rupert’s appetite in the past tense, but quickly apologises. Angus looks exhausted and Jamie passes him a bottle which the man gratefully accepts, saying that it has been a long night. He raises the bottle to Ross in salute and goes to sit down. 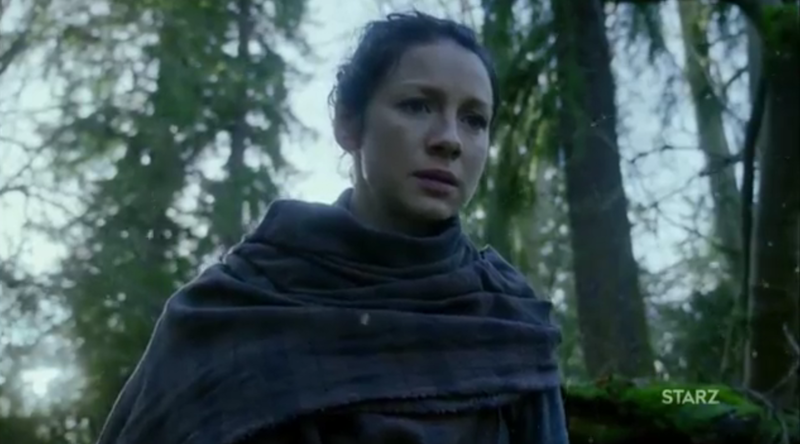 Walking past, Claire notices the mark of a horse shoe on Jamie’s shirt. Jamie admits that he was actually stepped on by a horse as the British soldiers retreated. Grabbing a bottle, Claire orders Jamie to fill it, so that she can inspect Jamie’s urine and check for kidney damage. Walking over to a British commander, Jamie hands the man the bottle, telling him to hold it while he takes aim. With a grin the man does so and quickly it turns into a game, with the soldier wagering sixpence on Jamie’s ability to reach the jar from a certain distance. Understanding the need for some levity after all the bloodshed, Jamie plays to the crowd, but it is an act that comes to an abrupt halt when Charles Stuart walks in. The prince thanks Claire for her labours. She curtseys in reply and tells Charles to be careful of the blood, as the floor is slippery. He launches into a speech about his distress at claiming victory over the English, as his interests lie in both countries, which should in truth be one. It is obvious that his speech is not being appreciated, but it is quickly interrupted by Dougal’s boisterous entry. Not seeing the prince that he had earlier impressed, Dougal is screaming “victory” and grabbing onto the women, when he notices the English wounded. He asks Jamie why the English “scum” are being treated as if they were kin. 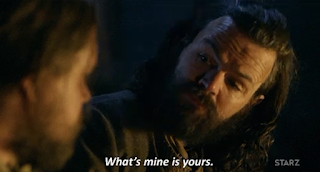 Jamie tells Dougal that the British have been taught a lesson that they will not soon forget, but the older man draws his sword again, threatening to kill them all. Jamie restrains him, saying that killing the men will not add to their victory. The prince then speaks, saying that the men are all his father’s subjects. Dougal whirls around, horrified. 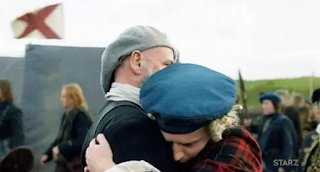 For the second time in the episode, he finds himself being touched by Charles, but instead of a grateful hug, this time the prince grabs Dougal around the face. Each man is Dougal’s brother, Charles says and despairs at his lack of Christian charity. The prince orders that Dougal’s name be struck off the Jacobite roll, as there is no place in his army for someone with such wanton disregard. Shamed, Dougal goes to leave, watched silently by everyone assembled. But Jamie the laird steps forward once again. Branding Dougal a warrior with an unfortunate tongue, Jamie suggests an alternative plan. Dougal should be given command of an elite group of warriors, to form the Highlander Dragoons, whose job it will be to follow the enemy, report on troop movements and harass the supply lines. In this way, says Jamie, Dougal’s abilities will be used, but the prince will not need to look upon him again. It is a proposal that Charles agrees to, praising Jamie’s ingenious mind and informing Dougal that he is in Jamie’s debt. Dougal thanks Jamie and assures him that he will not give his nephew cause to regret his generosity. But this is where his humility ends. 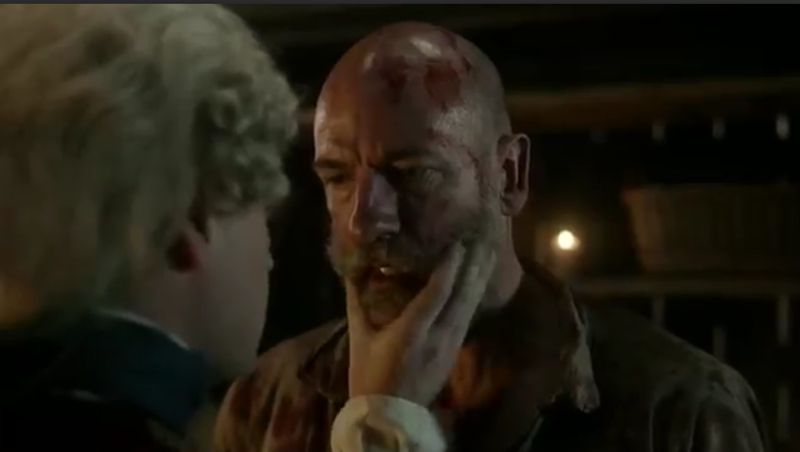 Grabbing Jamie’s arm, Dougal informs him that he knows what Jamie is up to: championing him and exiling him at the same time. It is, says Dougal, a plan worthy of his brother Colum. While it is probably not meant as praise, this is yet another indication of how much of a natural leader Jamie has become. Dougal goes to leave, but before he does, he asks Angus how Rupert is doing. There is no answer and Dougal repeats the question, remarking that Rupert is his friend too. He grabs onto Angus and suddenly we realise that something is desperately wrong. 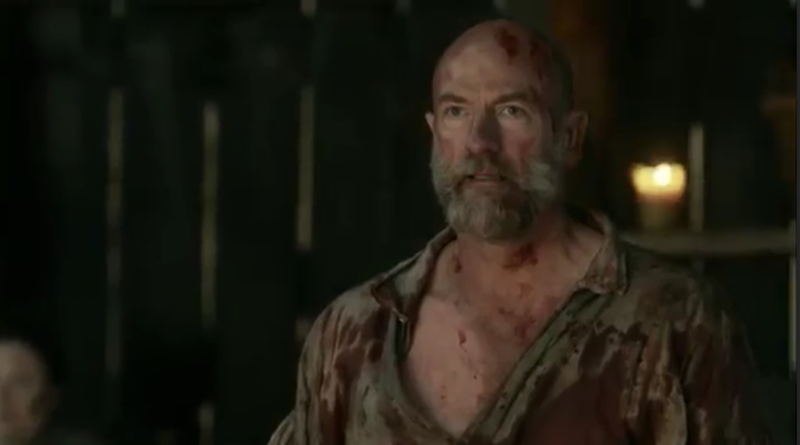 Angus is choking, his mouth full of blood and Dougal calls out at once to Claire. Horrified, Claire lifts up Angus’ shirt and sees the purple flesh below. Too late, she realises the significance of the canon blast. Far from being fine, Angus has been bleeding internally the whole time. Jamie asks if there is nothing she can do, a plea echoed on the shocked faces of everyone assembled. 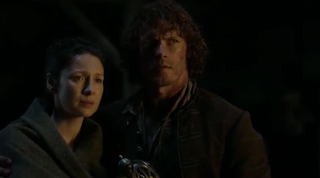 Angus too, is looking desperately at Claire, trying to speak through the blood. “Save me, Mistress.” But she cannot. It is an all too brief, tragic death scene. Angus the joker, the fierce warrior with the quick temper, Angus their friend, is gone. The grief is immediate. Heads bow, Jamie crosses himself silently and Claire strokes the dead man’s face. The silence is broken by an anguished cry. Determined and pale, Rupert rises from his sick bed. Without a word, he walks over to Angus, picks up the sword that had been promised to him earlier and unsheaths it. He carries the sword back to his bed and hugs it to his chest, looking over at the body of his friend. It is a farewell all the more heartbreaking for its simplicity. The scene ends with the group huddled around Angus and the shock is palpable. Ross punches the air and the crowd gives a cheer, but the final moment of the episode belongs to Rupert, who stares, bereft, at the ground. The battle has been won, but Rupert is a man lost. When interviewed and asked about his favourite episode of the season, Sam Heughan chose this one, for the brilliant performances by the whole ensemble. He added that while other episodes gave individual characters the chance to shine, it was this episode where everyone took their turn at centre stage. This statement is certainly true, not only for the actors, but also from the point of view of the cinematography and music. All aspects of the production combine and create a powerful, emotional hour of television. As viewers, we are left in no doubt as to the horrors of war. In the book, Claire remarks that history had deemed Prestonpans a rather insignificant battle, but it is clear that it was anything but. Statistically, the casualties may have been low, but emotionally, no-one will ever be the same. There are certainly no winners in this war. With Culloden still a few months away and the promise of history no longer on their side, the stage is well and truly set for a highly charged and emotional end to the season.